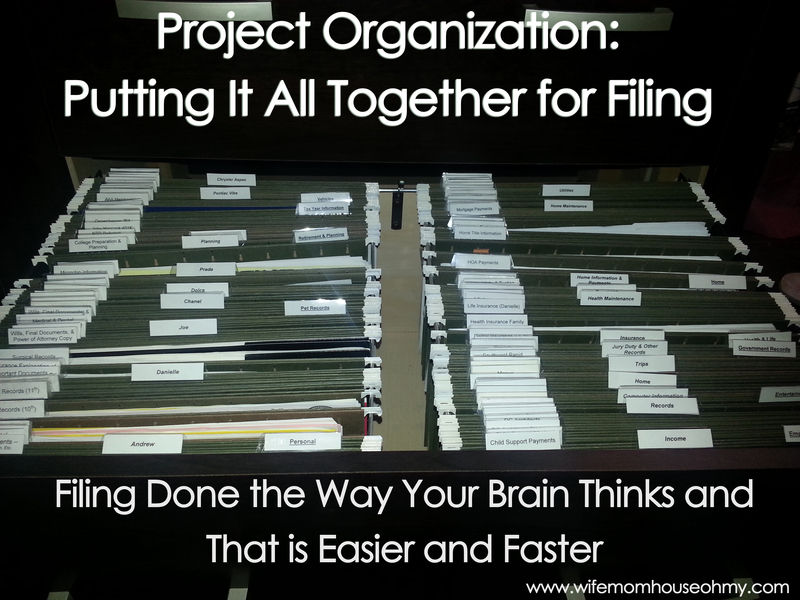 If you have been following my little project organization series, then you know the last two posts have been dedicated to filing and creating more organized and efficient filing systems. I’ve looked at purging your current files and then looked at developing systems that work for filing, otherwise called nature of the business filing based in how the brain works and what we naturally do. 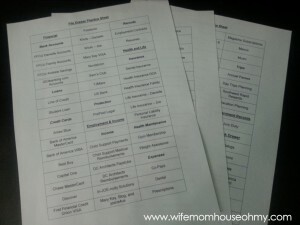 For this post, I’m finishing my own personal filing update (as I was adding new files and categories based on my recent expanded world of wife, mom and home owner) and will share with you how to pull it all together for filing in systems that will make it easy to file FAST and to always have room in your files. Here are my file folder labels. As you can see, the categories are bold & underlined, the subcategories are bold & italic and the file names are normal text. Now when I first heard of this system, I thought there is no way that this is going to be easier than plan old alphabetical filing. But the problem with alphabetical filing is you often can’t remember what the file name was you created for that one piece of paper and how did you file it. With this, the brain naturally gravitates to the category because it follows how we naturally think. I need to find the contract for the security system to see what the start date was for my insurance company to get a discount. Brain says – Home – Utility – Security System. Or, I just finished paying bills for all the utilities, and I can go right to the utility section and file them FAST. Between the way the brain operates and the way the files are laid out, its easy to find and file anything. Speaking of layout, once you have your Categories, Subcategories and File Names, you can lay them out on the File Practice Sheet I have provided below. Categories are BOLD and UNDERLINED, subcategories are BOLD and ITALIC, and file names are just traditional type. To assemble the hanging files, categories are the far right tabs, subcategories are the middle tabs and file names are the left tabs. You will have some folders with three or two tabs on them since category and subcategory tabs can go on a file with the file name. And I haven’t given up alphabetical filing. Categories should be filed alphabetically, then the subcategories filed alphabetically within the categories and lastly, the files within the subcategories. It takes a little bit of time to set them up but after the last several years of filing by nature of business, I will never go back. Its so intuitive and is easy to add to or modify as things in life evolve. For Tax Information, I suggest only three files – Charitable Donations, Current Year Information, and Previous Year’s Filing. All other items we need for taxes don’t really come in till the end of the year and therefore can go into the Current Year Information or is filed else where like Medical Expenses under Health and Life category. I do suggest keeping the previous year’s filing as, at least for myself and my family, I do often reference some data on them. Now, I did discuss the active versus reference filing in my post on systems for filing, but as a refresher, Active Files are those that you have your hands in daily or weekly or that you want fast and easy access to or with in reach. For me with respect to my personal and not professional roles, I like to have my financial files in my desk drawer but I also have mailing labels in a folder, receipt folders for the cards (we like the miles and cash back) we use frequently, upcoming events, catalogs were order from frequently, etc. I create Categories, Subcategories and Files based on the same principal as above. That being the case, I recommend that you rotate each file annually and when the tax filing finishes the last year, you shred it. For example, when I filed 2013 taxes, it stayed in my file in my office (see above). Taxes for 2012 moved into Year 2 in Dead Storage and 2011 moved from year 2 to year 3. And 2006 got shredded. (Now I keep all my front ends but that is up to you). You don’t need to create separate files for each account. 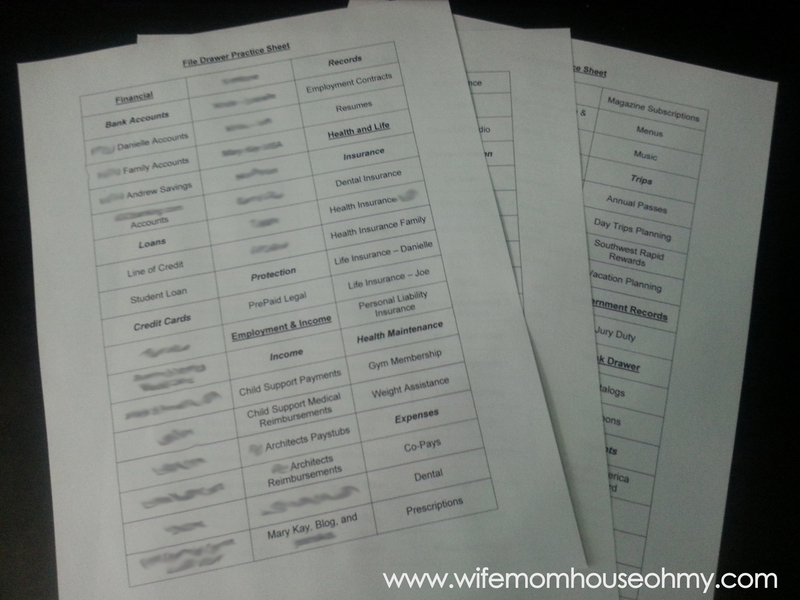 I just binder clip each accounts statements together and put them in file. If I need to reference them, they are easy to locate. I rotate them the same as above for taxes. Typically you want to keep house sale, mortgage, purchase and improvement paperwork for at least four years after the tax year in which you sold the item. This is the same for anything you claimed on your taxes like I claim my car because of my business. I do keep separate folders for each of these. So that I know when to purge them, I get those Post-its that have stick all over them, and put that on the outside of the folder with the purge year on it. So for example, my husband’s previous house sold in 2012. On the folder’s post-it, it would say 2016. So in January 2017 or December 2016, I would shred the file. I typically keep these for one year after the contract or service expired and I use the same method as with previously owned items for purging. Typically once I close an account or have sold an investment, I keep the final statement and closing letter if applicable. Everything else I shred. The only exception are those accounts that have statements related to taxes. For all these closed accounts, I the final statement in a folder in dead storage. You would be surprised but you may need. I remember my mother applying for a car loan and when they ran her credit she discovered more than one account that was suppose to be closed that credit agencies were reporting as still open. Her closing letters and statements got it fixed. If you set up your files like above and conduct routine and systematic purging, you office and dead file storage will never get out of hand. Purging doesn’t have to be overwhelming either. I suggest that once a year, you purge. Shoot for annually around January 1st or December 31st but at least for the month of January. Its perfect timing as you won’t have any of the new year’s filing to get mixed in and its simply a matter of pulling and shifting. Only exception is school folders for kids. That I recommend doing after school lets out for the year. 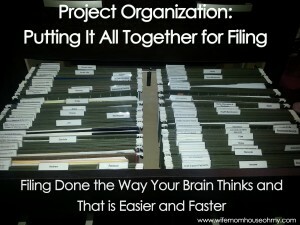 I hope you can find the same benefit I have from having organized, efficient files. Being clear of clutter or distraction of mounds of paperwork or the frustration of not finding something I have filled, I have found myself to be more productive and enjoy being in my office. If you have any questions, please let me know and I would love to know your thoughts!